Get your gas and GO! Kwik-Gas is a convenient, small gas cylinder exchange program and is one of the safest and most reliable cylinder swap services around. These small cylinders (3.7kg and 8.5kg) are typically used for barbeques, outdoor heating and camping gas appliances. Simply take your empty (or damaged) Kwik-Gas cylinder to an outlet and exchange it for a new or refurbished filled Kwik-Gas cylinder. 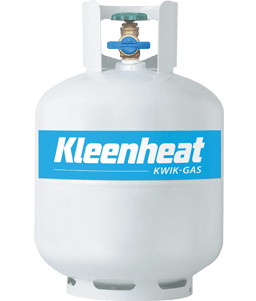 If you have a non Kwik-Gas small cylinder that’s fine! Just take it to an exchange and swap it over. You can also purchase Kwik-Gas cylinders at outlets if you don’t already have one. Kwik-Gas is also available at many retail locations across Australia including Bunnings Warehouse, selected service stations (Quix, Mobil, Coles Express etc) as well as many caravan parks and convenience stores. Available in two convenient sizes – 3.7kg and 8.5kg. With Kwik-Gas, your ‘out of test date’ cylinders are accepted at no additional cost, subject to them being in an acceptable condition.